This entry was posted in Uncategorized and tagged Ceremonies, culture, Khru, Kitiya, marriage, Thailand, Traditions, wedding by christao408. Bookmark the permalink. very nice! especially the duet part. it’s nice to attend happy weddings like this and i too hope that they have a great life together.btw – won’t be posting for the rest of the week so happy new year to you and tawn! be well! Congrats to them!Good looking couple too! Congratulations to your teacher and her new husband. Agree with yang1815, your mentor is beautiful. Hope they have a wonderful life ahead of them. The bride is very beautiful. She can become Miss Thailand! What fun. I love weddings. You have mentioned this Thai teacher in several of your posts, and I always thought she’s one of those middle aged Thai woman. Wow! What an pleasant surprise to see such a pretty teacher. Chris has good taste in choosing a teaching mate! Aww I love reading about different wedding traditions around the world, and it’s even better with photos!Thank you for sharing with us this day, and I wish the newly married couple a wonderful and happy marriage! What a wonderful couple and the bride really is beautiful. All good wishes to them for their future together. Great photo’s Chris and it’s lovely to learn about different traditions around the world. Your teacher is beautiful. I love reading about wedding traditions. I would never have noticed that string tying them together in the pic without you pointing it out! They look very beautiful. I like seeing how other people tie the knot. Wow, she is beautiful, Chris. Congratulations to them. I have attended such a wedding and it is beautiful as are the bride and groom at this one! The newlyweds look beautiful! 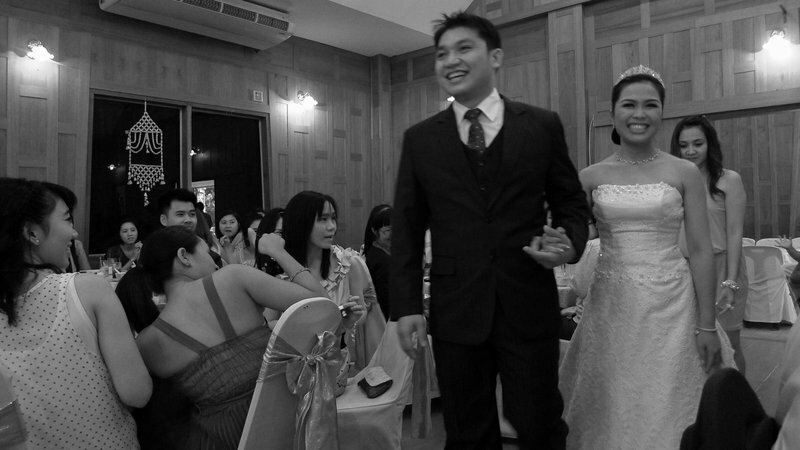 And it’s always fascinating to see how weddings are done in different cultures. They have all these interesting traditions and little things that symbolize the bond between the couple, which is always a beautiful way to symbolize love and commitment!I hope the food was good, and you ate a lot! I am with everyone here… your mentor looks gorgeous. Congrats to her and her husband. I don’t know when the next time I’ll be on is, but I hope you and Tawn had a great holiday and have a great new years! 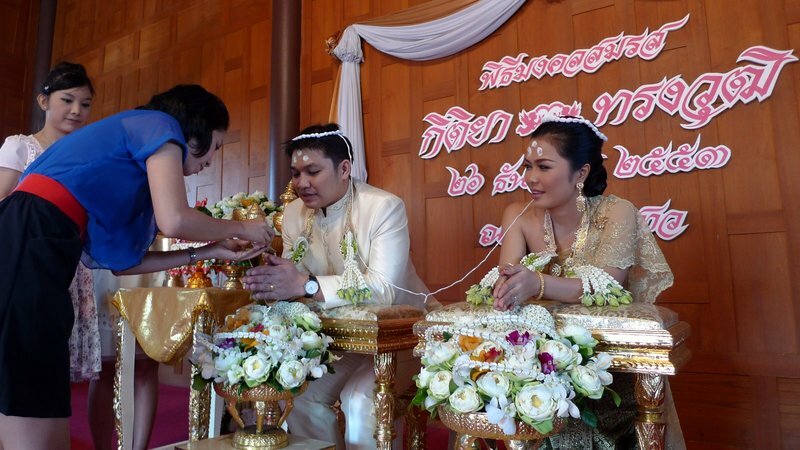 Congratulations to Khru Kitiya and her new husband. She looks so happy and what a beauty! Cheers to the newly wed couple!! !They make a lovely couple too! What a Merry Wedding! cheers to the lovely couple! @PeterGT – Peter, while I don’t want to play the role of censor, I’d like to invoke my grandmother’s advice: “If you don’t have anything nice to say, then don’t say anything at all.” There’s certainly nothing gained by you making such a mean-spirited remark. @yang1815 – @Southeast_Beauty – @ClimbUpTreesToLookForFish – @amygwen – @MichellelyNg – @puella_sapiens216 – @Chatamanda – @brooklyn2028 – @Ikwa – @TheCheshireGrins – @Roadlesstaken – @ZSA_MD – @NightlyDreams – @Fatcat723 – @stebow – @kenpcho – @agmhkg – Thank you everyone for your kind words and congratulations for the married couple. I will be sure to pass your best wishes along to them. I’m sure they will be tickled to know that more than 300 people around the world have viewed the story of their wedding. @Redlegsix – We have a few bags of those gold coins, too. Even though they are just 25 satang (quarter-baht) coins, they are meant to bring you wealth and good fortune. Hopefully in all the years you have had them, their magical powers have proved their ability for you and Pat! =D@seriously_meredith – Oh, I’m glad that these pictures reminded you of your friend. I hope she returns home safe and sound soon. @AzureRecollections – The food was nice and there were some tasty variations to the typically Chinese banquet menu. @CurryPuffy – Oh, it is interest that you had drawn that mental picture over the past few years. No, in fact she is younger than Tawn and is working on her master’s degree right now. @ThePrince – @bengozen – Thank you for the new year’s wishes. The same back to both of you. she’s beautiful! every time you mentioned of your teacher in your blog, i’ve always had this image of a much older lady. don’t know why. They look like a very nice couple. 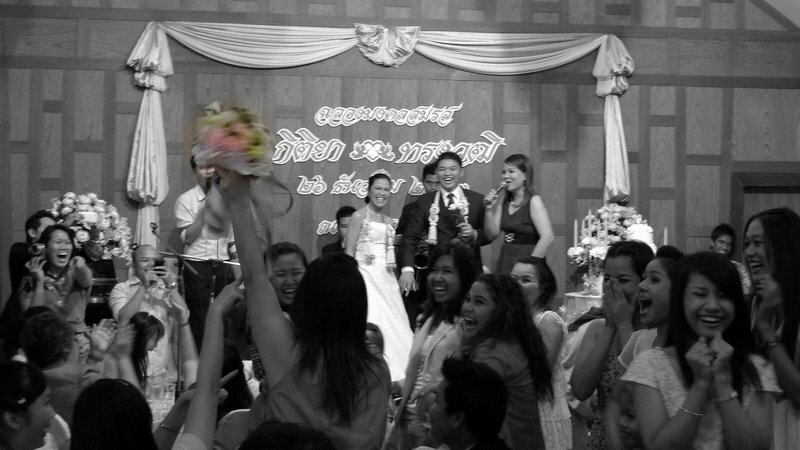 Do the bride and groom play those silly games during the reception? btw – I had the same impression of your teacher as Gary. @ElusiveWords – There were no silly games played, at least for the time that Tawn and I were there. I know what you are talking about, though, having been to many Chinese weddings. @murisopsis – Glad you enjoyed this glimpse into the Thai way of life. Everyone was very happy, to say the least. @rudyhou – Funny how you, Matt, and Gary all pictured my teacher as being older. There has been two pictures of her on my blog over the years, but it would have been easy to miss those. 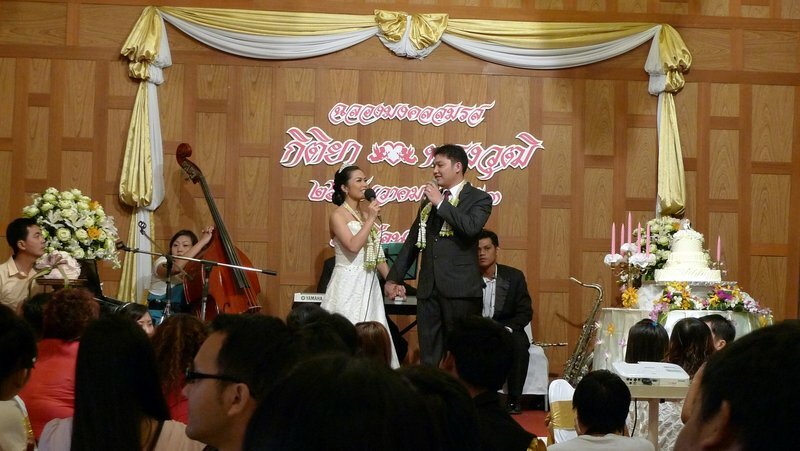 Best wishes to Khru Kitiya and her husband on their marriage and for a long life together. I remember her patience with all of us as we tried to learn the most basic of Thai phrases. hhmm…. what can i say, great minds think alike ;p happy new year to you and tawn.